I’ve finally added the Compiz packages to my development repository and unity itself alongside with some tools. There are several bug reports on launchpad concerning ATI users, involving RADEON DRM driver and FireGL (fglrx) drivers. Unfortunately for me, I’m also a very happy ATI customer. I’ve struggled yesterday with some ABI problems on compiz, this was mainly because I had git snapshots from different days, and updating and rebuilding it, really solved the issue. Today I’ll be implementing the required patches for compiz by Ubuntu,, and hopefully this will enable me to test Unity, this time on a spare laptop with Intel Graphics chipset. I was hoping to pop some screenshots today, unfortunately, I’m having a couple of problems with Compiz that hopefully a couple of missing patches will solve. I’ve left behind the ‘clutk’ package, as it’s currently broken and I need to take closer look into ‘glew’ and work it out. Something for monday/tuesday spare time. 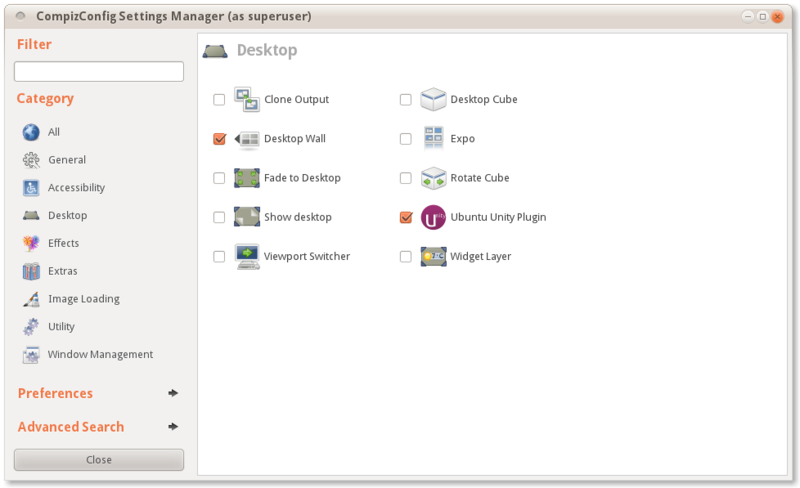 For the time being, the only screenshot I have to show is the one of CCSM (compizconfig-settings-manager) with the Unity plugin.